A kidnapped child was always a difficult case. The fact that this was the second abduction of Ellie Mulder added an additional layer of complexity. Adam Raiker had been involved in her first rescue, and her parents had called him to find her again. Macy Reid was a forensic linguist, and member of Raiker Forensics. She was used to working in stressful and difficult situations. She could deal with the roadblocks put up by CBI Assistant Director Calvin Whitman. He made no effort to disguise his distrust of the Mulders and the fact that they had brought in Adam Raiker's team. What she truly did not appreciate was having to deal with her co-worker Kellan Burke. Kell really didn't care about making friends on this case. He had no intention of ever living in Denver - who wanted to be around this much snow? - and his primary focus was on the successful rescue of Ellie. The only exception to this was Macy. They'd had one night a few months ago, but Macy had pulled away and kept a rigid barrier between them ever since. He was good at his job, Adam only hired the best, and he was very capable of multitasking, much to Macy's chargrin. Deadly Intent grabs your attention from page one and doesn't relinquish it until the very end. Waiting with Ellie as she dealt with a monster is spine chilling. The romance between Macy and Kell was enjoyable, but sometimes took a step back for the suspense. Which is understandable in such circumstances. 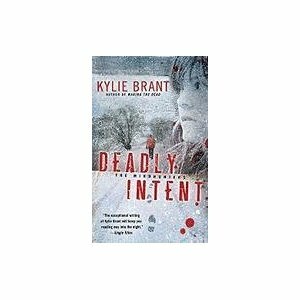 Deadly Intent is the fourth story in Kylie Brant's Mindhunter series and can be read without reading the prior three, but it cannot be called "standalone" because there is a mystery which is unresolved at the end.